Today, the California DMV released the following list of 100 banned license plates. The list, accumulated over the past few years, has some obvious offenders. Others, like "3MTA3," are a little trickier to decode. How many of them can you translate? 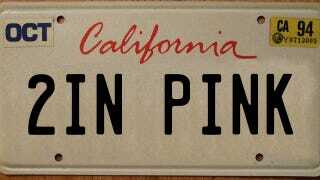 We've made plates of our twenty favorite banned California license plates — peruse them above — and then head over to the last page at the end (or, if you don't want to scroll through the plates, click the little double-arrow thing a few times and then click on the last image in the gallery). Thanks to NBC Bay Area! Here's the full list of 100 license plates banned by the California DMV.